I've been doing giveaways on my facebook page to try and get more fans. I hit 500 fans the other day! I did a drawing for a grand prize and then 5 winners. 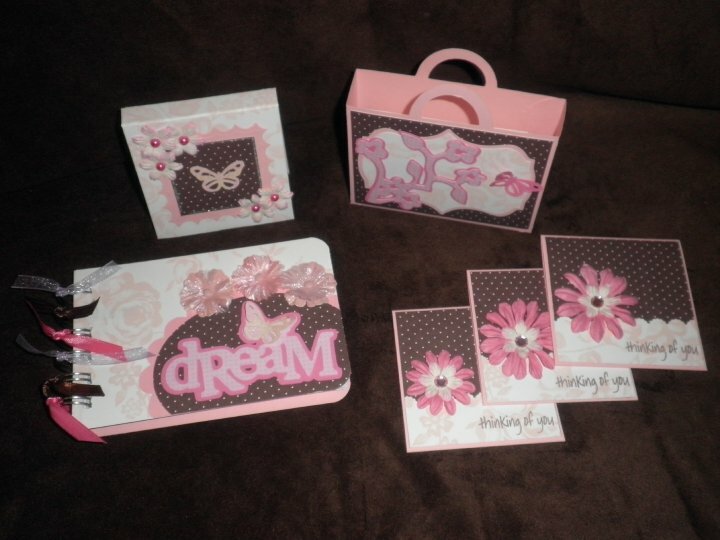 The grand prize was either scrapbook embellishments or handmade items and then 5 winners all won a custom card. If your not already a fan of my facebook page then become a fan today! As you can see below, Emily, the grand prize winner, chose handmade items :) I made her a notepad, post it note booklet and a little mini box that holds 3 3x3 notecards with envelopes. The box is from Tags Bags Boxes and more. The background design on the box is from Gypsy Wanderings and the flowers are from Storybook. The notepad was made using Gypsy Wanderings and Stamping Solutions. I did not use any cricut on the post it note booklet or the mini notecards. The post it note booklet was made using nestabilities and a martha stewart punch. The notecards were made using a border punch. Thanks for looking! Happy Friday!! Those items are wonderful, Candace!! I can see why the winner chose them. I would have chosen them too!! What are great prise! Thanks for the lovely comment you left on my blog.I'm gonna go check out you FB page now!